Thank those who work with young people in a unique way with this personalized plaque. 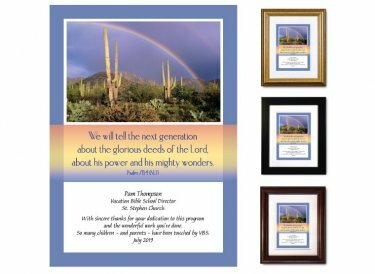 The image of a rainbow over the Sonoran desert in Arizona conjures up the story of Noah's ark, always a children's favorite. We will tell the next generation about the glorious deeds of the Lord, about his power and his mighty wonders. You'll add the receipient's name, job title and your church/school name. There's also ample space available to add a special message.